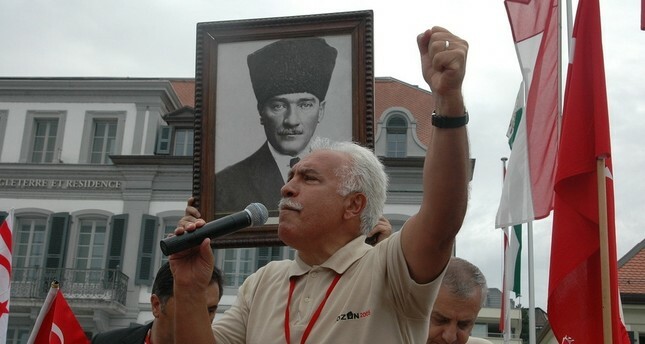 The Supreme Court of Switzerland has overruled its judgment of Doğu Perinçek, a prominent Turkish politician and leader of the Vatan Party, over his conviction for denial of the Armenian genocide in 2005 in Switzerland. The decision came after the European Court of Human Rights (ECHR) ruled in favor of Perinçek in October 2015, denying allegations of racial discrimination and evaluating his comments about the 1915 event surrounding Armenians within the framework of "freedom of speech." The court also reversed his judicial fine and ruled that he will receive compensation in the form of 2,500 Swiss Francs ($2,560) from the Federal government and Switzerland-Armenia Association. "This is victory won after an 11-year struggle," Perinçek said to Daily Sabah, mentioning his long struggle with the Swiss Federal government that started after his denial of Armenian genocide claims in 2005. Perinçek said that the most important point of the court's decree over the decision is the statement that cites the ECHR's decision and says "The state's court cannot rule for such a genocide case. This kind of verdict can only be given by either the International Criminal Court (ICC) or by the court of the state where the crime is committed." Perinçek mentioned this statement as a possible landmark for other countries that accepted the claims of "Armenian genocide." "Since the beginning, the issue has been discussed incorrectly worldwide as well as in Turkey, and that is whether the genocide really took place or not. This is a wrong perception. The important thing is, any court, like the Swiss Supreme Court ruled, cannot serve as a verdict for such a decision. This is an issue that can be discussed by historians alone," Perinçek added. He said that even though the judicial process is over, now another important political process is starting. "As the Patriotic Party (VP), we will be following up for the lifting of the decision taken by the Swiss Federal Parliament," Perinçek said. He added that the first initiation was taken by Yves Nidegger, a deputy of the Swiss People's Party, as he motioned the parliament for an amendment to Article 261, which rules criminal conviction for the denial of Armenian claims. "The motion by Nidegger differentiates between the holocaust and other genocidal claims and urges the courts to avoid making any decisions about those claims. If this motion is passed, we will also win the political phase of the process," Perinçek concluded. Perinçek was convicted by a court in Switzerland, where denying "Armenian genocide" is criminalized, for his remarks branding the genocide "an international lie" in that country. He had argued that the denial was in line with his freedom of speech and took the case to the ECHR. The court had ruled in his favor in 2013 but Switzerland appealed the verdict. In October 15, 2015, the ECHR rejected Switzerland's appeal to overrule the conviction, and ruled in a landmark verdict that Doğu Perinçek executed his right to free speech when he denied the Armenian genocide in Switzerland where he was convicted, citing a democratic society would not subject Perinçek to a penalty for expression. Judges further said Perinçek's statement, which was a matter of public interest, "did not amount to a call for hatred or intolerance." In the events that led to the present case, such as various conferences in Switzerland in 2005, Perinçek rejected allegations that events in 1915 and following years in the Ottoman Empire amounted to "genocide" of the Armenian people. The Switzerland-Armenia Association then filed a criminal complaint against Perinçek, and he was tried by the Lausanne Police Court in March 2007. He was found guilty of racial discrimination and fined. In 2008, Perinçek appealed to the ECHR, claiming that the Swiss courts had violated his rights, including that to freedom of expression. He demanded compensation of 140,000 euros ($157,200) for moral and financial damages as well as court expenses. Armenia claims that up to 1.5 million Armenians were killed in acts of genocide by the Ottoman Empire in 1915 during World War I. Turkey accepts the mass deaths of Armenians during their forced deportation during the war but claims the death toll was much lower and attributes the deaths to diseases and isolated cases of attacks. Ankara has also urged Armenia to let historians handle the matter, though Armenia demands recognition of the incidents as "genocide" in order to advance relations between the two neighboring countries. Turkey also has called for a joint Armenian-Turkish research project into the events, making use of the archives in both countries, to establish the facts.